With November coming to an end I am going to recap my goals that I posted about a week into November. I will take a look at what goals I managed to accomplish and which ones I didn’t (and why). Below my November recap I’ve got my December workout goals. December is possibly the hardest month of the year to be strict with your health and fitness goals because of all the excitement for Christmas, travelling, eating, drinking, relaxing, etc. I plan to enjoy all of that stuff, but still stay somewhat strict with my fitness goals. Me and my girlfriend just booked a vacation to a nice resort in Mexico for February, so now I finally have some good motivation for getting into great shape again! Workout 5 times per week – I got this done for the most part, but unfortunately I was battling a sickness for about a week and only got to the gym twice during that week (very low intensity workouts too). If it weren’t for getting sick I would have hit the goal of 5 workouts per week. Hockey twice per week – Yup, I made it to all skates this month (even when I was sick I got out there for a skate as I felt well enough to play). Cardio workouts 2x per week – I didn’t start this in November, mainly because I had gotten sick the week I was going to start doing the stair master. I did play some football throughout the month though which is great cardio (sprints). Eating healthy – I did a good job with this, especially this past week where I got really strict. My goal was to make sure I got a grocery routine going so that I would have healthy food around, and that worked. I limited my carbs quite a bit this week and even did a fast on Monday. Weigh in at 197 – Unfortunately I haven’t weighed in this week, but judging from the mirror I would say that I did get down to 197. I will check tomorrow when I go to the gym and I will try to remember to update this post. My first goal is to workout 6 days per week in December up until the 21st of the month. 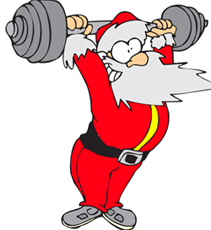 After that my goal is 4 workouts per week (as the holiday season is busy and the gym is open for shorter hours). 1 day completely away from the gym is necessary as I talked about in my November goals, and I usually use that day on a Saturday or Sunday. 2 Cardio workouts at the gym for the first three weeks. This will give me 6 cardio workouts throughout December for sure if I complete this goal, plus about 6 hockey games, and maybe some football if there isn’t too much snow. The cardio sessions are necessary for my fat loss goals, and this month I definitely need to get after it. Find a workout program to start. Lately I’ve been creating my own workout programs, which are fine. But sometimes you need to change it up. I kind of get into a routine doing similar workouts month after month, and I want to try and find a good, intense workout program that someone else has created. That will help me perform new exercises I don’t normally use in my programs. If you have any suggestions please leave them in the comments below. My goals are to lose weight and maintain muscle, and I prefer a program that requires lifting weights 4-5 times per week. Eat strict 5 days per week, semi-clean 1 day, and 1 cheat day. This goal is similar to last month, where I plan to eat very healthy 5 days per week (usually Monday to Friday), semi-healthy on a Saturday for example, and then use Sunday as a cheat day. My clean eating will include a lot of protein (chicken, steak, eggs, fish, etc) and vegetables. Being the holiday season this is going to be extremely tough to do around Christmas and New Years, so I will give my self 2 cheat days per week at the end of the month. Do a fast every Monday. I’ve talked about Intermittent Fasting in my last blog post. Basically I plan to eat a meal Sunday night and then go all of Monday until about 10 pm without any food (just a Greens shake and a protein shake after my workout). I’ve learned that regular fasting isn’t recommended for females*. That is all for December. Do you have workout goals? Leave them in the comments below.